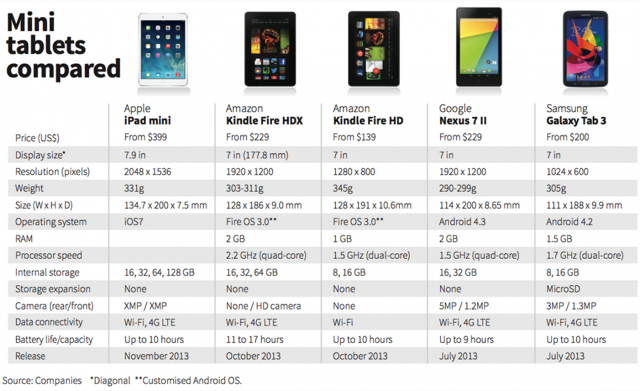 Check out this chart that compares the specifications and price of the new iPad mini to the competition. While Apple's display is 0.9-inches larger than its competitors, the device is priced $170 higher than Kindle Fire HDX and Google Nexus 7 II. It's $199 more than the Galaxy Tab 3 and $260 more than the Kindle Fire HD. Notably, Apple decided to increase the price of the new iPad mini by $70 due to its new Retina Display. How do you feel about the new $399 price tag?